In order to request certificates manually or automatically, for example for wireless access, you need to configure Dell Wyse ThinOS to request certificates. This process requires you have the Network Device Enrollment Service (NDES) role setup in your environment. This is what implements Simple Certificate Enrollment Protocol (SCEP), which is used to issue certificates. The setup outlined here uses a Microsoft Windows Server 2012. In addition to having an internal Certificate Authority setup in your Active Directory environment you will also need the Network Device Enrollment Service (NDES) role installed. This is role/service that implements the Simple Certificate Enrollment Protocol (SCEP) used to issue certificates. If not already setup, you can setup your Certificate Authority following steps here. If not already setup, you can install and configure the NDES server role here. The Setup section here outlines exact steps to setup your NDES server to start handing out certificate. How do you setup Dell Wyse ThinOS to request certificates from your Network Device Enrollment Service (NDES). You will first need to setup your NDES environment by following steps in requirements section. Once setup your device will be able to request certificates manually or automatically. We will first cover the manual process to have the device request a certificate from the NDES server. 1. On Dell Wyse ThinOS go to System Tools\Certificates and select “Request Certificate” and the following screen will appear. CA Certificate Hash Type: if using MS CA/NDES server then this should remain MD5. Even though your server may issue SHA256 hashed certs, MD5 is what is used to issue the request but cert will be signed however you have them configured, i.e. SHA1, SHA256, etc..
CA Certificate Hash Value: You will need to browse to the following location on your NDES server; http://hostname/certsrv/mscep/mscep.dll. You will then click link, http://hostname/certsrv/mscep_admin to get the Hash Value and Enrollment Password. * NOTE * Be sure to include spaces in the Hash Value name as it shows on the webpage example below. Enrollment Password: This will be the password retrieved from above. Note: Be sure to check off “Install CA Certificate” so this is also installed otherwise, the certificate will be installed under ‘Unknown’ on client and not be chained correctly. 4. Click “Install Certificates” and both certificates will be installed on the client. NOTE: You can also verify it has the correct Signature Algorithim, i.e. SHA1 or SHA256 or whatever your CA is set to. NOTE 1: Even if Signature Algorithm is set to SHA256, the Thumbprint Algorithm will be set to SHA1. This is expected as noted here. Note: To upgrade your CA from using SHA1 to SHA256 you can follow steps here. 5. This completes process to manually request certificates. In order to Dell Wyse ThinOS request certificates automatically you will have to do this via an INI file or Wyse Management Suite. The values you will use to do this are outlined on the 8.4 INI guide and you can get documentation here. Issue: When attempting to downgrade ThinOS firmware from version 8.4.x to earlier versions, i.e. 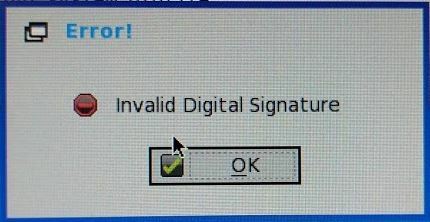 8.3.x, 8.2.x, etc.. you may get the following message, “Invalid Digital Signature”. Resolution: In order to rollback the version of firmware you need to add the following parameter to your wnos.ini configuration file or WMS/CCM configuration. See v8.4 INI guide for further details here. Wyse ThinOS fails to auto-create local/USB printers using the Citrix Universal Print Driver when connecting to XenApp 7.8 on Windows Server 2008 or 2012 servers. The issue occurs if the local Wyse ThinOS printer “identification” field is set to use the “PCL5” driver which ThinOS is set to use by default. On Windows Server 2008 R2 and 2012 servers running Citrix XenApp 7.8, and other versions, they do not have the specific PCL5 driver, “HP Color LaserJet 4500 PCL 5”, installed by default. This specific HP driver is the PCL5 driver that the Citrix Universal Print driver uses and is not installed by defaults so it needs to be manually installed. By default, the server does not have the “HP Color LaserJet 4500 PCL 5” installed as shown under print server properties. As shown in the registry, the Citrix UPD uses this driver to map the PCL5c driver and since its missing, auto creation from ThinOS fails. By default, Wyse ThinOS is set to use a PCL5 driver under “Printer Identification” field so when the printer is auto created it attempts to map to the PCL5 driver on the server which is missing so auto creation fails. By default, the Citrix UPD is set to “Use universal printing only if requested driver is unavailable” and the UPD driver preference order is set to; EMF;XMS;PCL5c;PCL4;PS. As noted above, “non-windows clients do not support EMF or XPS” so the first driver it attempts to use is PCL5c which is not installed by default so auto creation from Wyse ThinOS PCL5 fails. If Wyse ThinOS “Printer Identification” was set to use PCL4 or PS then auto creation would succeed as those 2 drivers are installed by default. This issue and resolution is also documented in the following PDF Technote – Wyse ThinOS and Citrix UPD Fails to Autocreate Printers. One of the great new features in the release of Skype for Business on Citrix XenDesktop is the ability to use a non-Windows, Wyse ThinOS, endpoint as the client device to support new Skype features. Previously, you were limited to using a Windows endpoint running a full Windows PC or Windows Embedded thin client. More importantly, your able to leverage the power of the Citrix Real Time Media Engine (RTME) which is embedded in the Wyse ThinOS for audio/video offload. This allows the client to offload rendering from the server VM onto the client leveraging the client CPU/memory to process audio/video. This freeing of VM resources allow greater server/desktop density and better performance as local client resources are also being used. The key benefit of leveraging the RTME support is you eliminate the traditional VDI hair-pinning of the unified communications audio/video traffic which would route all the audio/video traffic through the virtual machines as illustrated below. This is very well illustrated in below video.